3. Continue to maintain tension on the bobbin with your left hand. 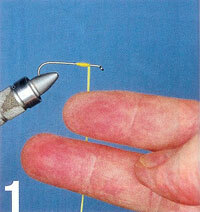 Twirl your index and middle fingers inside the loop, wrapping thread around the hook and standing thread. Important: do not wrap the standing thread leading to the bobbin around the hook. The goal is to make four or five wraps of thread over the standing thread; you must bind the standing thread against the hook. 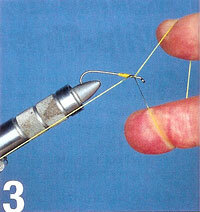 Here’s another important point: The hook eye must remain inside the triangular loop of thread. 4. We’re ready to tighten the knot. Continue to maintain tension on the bobbin. 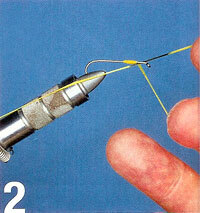 The thread is looped around your index finger on top of the fly. Now press your fourth “ring” finger against the knot; this will hold the wraps of thread in position while you complete the whip-finish. 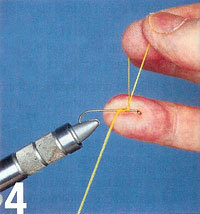 Grasp the thread loop with your index finger and thumb, and begin pulling the bobbin down. Lower your thumb and index finger to the hook as the noose tightens. Give the bobbin a gentle snap to pull the thread from your fingers and tighten the knot. Now you may clip the thread.